Rizzoli bookstore, New York. Photo: LUXE City Guides. ‘A library is full of new worlds to travel’, or so the adage goes, but we believe quite the opposite – that the globe is packed with paperback pushers well worth travelling to. Book nerds and interior aficionados, get passports and specs ready for this divine dozen of biblio boltholes. 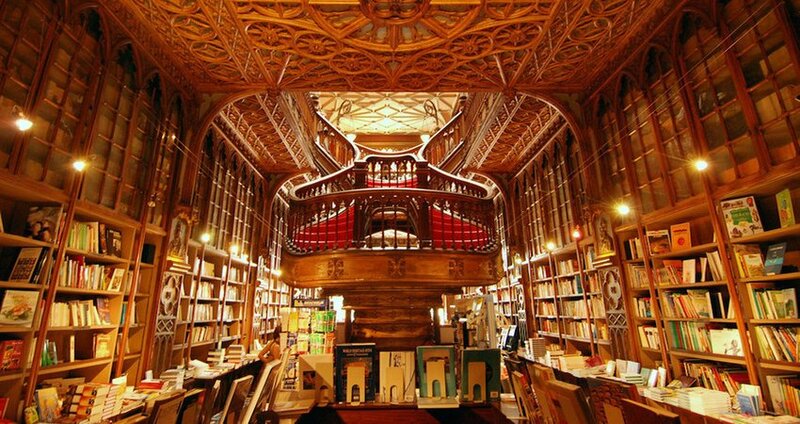 You can certainly judge this bookstore by its cover – a neo-gothic facade featuring ornate reliefs and painted figures representing Science and Art. And the inside of 100-year-old Livraria Lello is just as magical, with a stained-glass ceiling, arched shelves and intricate curled staircase. With rambling rooms, steps made from old opuses and an oh-so charming canalside locale, Libreria Acqua Alta (pictured above) is certainly one of the most enchanting book nooks to be found anywhere. But its position just inches above sea level means the vast stash of new and used English and Italian titles is at risk of being washed away as the water rises each winter. Owner Luigi Frizzo came up with an, ahem, novel solution – store the works in gondolas and bathtubs, so when the acqua really gets alta, the libros stay dry. 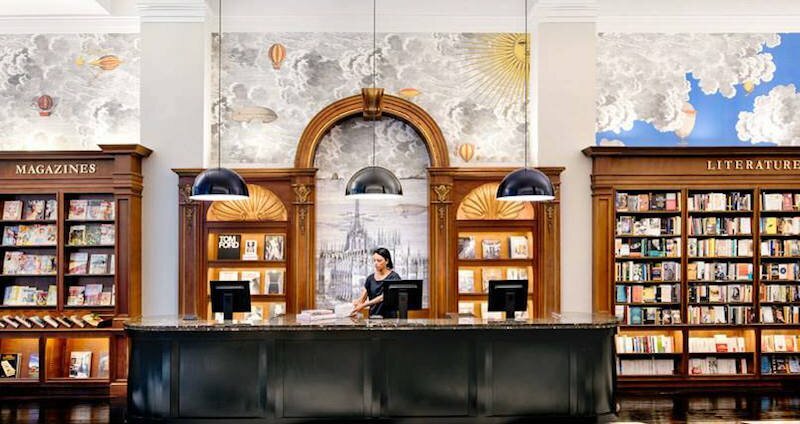 This luxury, limited edition bibliotheque on bustling Piccadilly (set in a Grade II-listed former bank, no less) boasts not only a back catalogue of 1,400+ cultural and coffee table tomes, but also a room devoted to sumptuous furnishings for your at-home library, and the suave Swan Bar, serving coffee and classic ‘tails to sip while you scan the shelves. C’est chic! Situ’d in Downtown’s historic core, the last word on opus emporiums stocks best sellers and records on its stately, columned first floor… But it’s the mezzanine level that’s the true treasure, an uncategorised literary labyrinth with tunnels constructed from outdated encyclopedias, storybook sculptures and hidden alcoves. Best of all: everything up here is only one dollar. Sure, Shakespeare and Company is quaint and Galignani grand, but how can you skip a bookshop on a boat? Bobbing atop a serene stretch of the Seine in the Ourcq, L’eau et les Rêves (Water and Dreams) is a lovely lil’ library within a black barge; a river-reader specialising in all books nautical, plus a pirate-heavy selection for the kiddies. Barge in! Perched above shopping strip Istiklal Caddesi is this local literary institution, lined floor-to-double-ceiling with fiction, fine art, history and travel titles. With rolling ladders, a reading table and piano, it exudes a warm library atmos, and patrons are positively encouraged to park their bots in cushy armchairs – or better yet, on the sunny rooftop terrace – and browse before buying. It has been a fairytale ending for this Manhattan stalwart. Evicted from her original abode in 2014, she has now reopened in a historic NoMad building complete with molded cherrywood shelves, brass chandeliers and custom wallpaper. An upsized 5,000 sq ft space = more room for page-turner fiction, philosophy works and foodie cookbooks. One for the minimalists, this white-walled, bare-bulbed Neukölln Bibliothek divides its curated collection not by genre but by – you guessed it – topic. Each of the 80+ cubes contain a separate selection on subjects ranging from time machines to transsexuality to the femme detective. 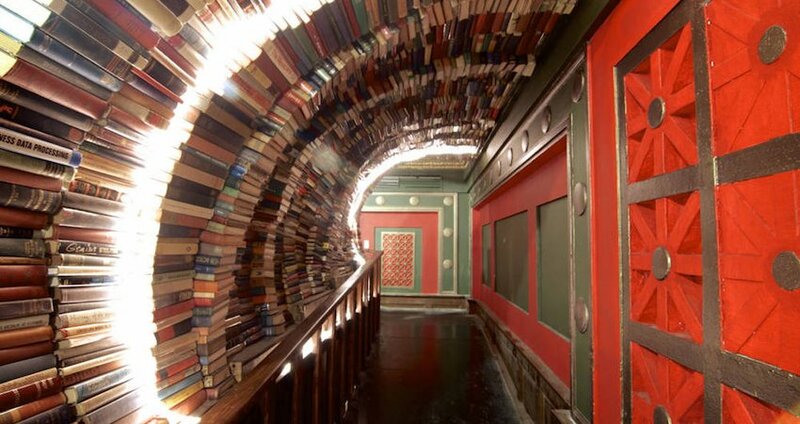 While most of the shops on this list boast walls covered with tomes, the central store of São Paulo chain Livraria de Vila also heaps its hardcovers along ceiling cut outs and the swiveling doors of its front facade, giving the illusion that it is literally built from books. The tri-level, Mid Century Mod-styled Tsutaya flagship is stocked with every kind of reading, listening and watching pleasure. 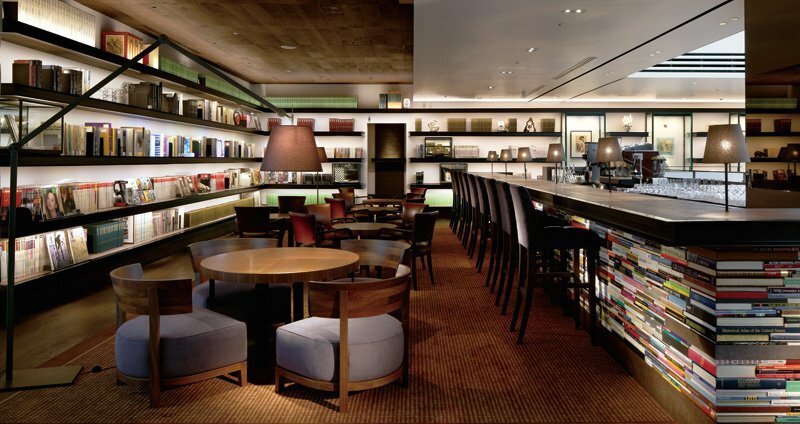 Peruse for page-turners in the extensive selection of English merch, then saunter upstairs to the Anjin lounge and take an artisan brew while you fall into the first chapter. In summer readers revel in the outdoor lot of Brattle Book Shop, one of America’s oldest and largest paperback pushers. It holds three stories of general, used and antiquarian works, plus the open air sale section sided by an urbane scene of street art and fire escapes. Nestled in the arty Tiong Bahru nabe, this curio-crammed cutie is packed with fiction, classic literature, local works and poetry. But she holds more than just books actually: the back room showcases an adorable assemblage of hand-stitched notebooks and stationery.